2) H.H. Muhammad al-Hadi Pasha, Possessor of the Kingdom of Tunis - see below. i) Prince (Sidi) Ismail Bey. b. 26th June 1944. He d.v.p. 26th October 1944.
i) Princess (Lalla) Rafi'a. b. 6th June 1936 (or 30th June 1936-El Mokhtar) (d/o Princess Zanukha). 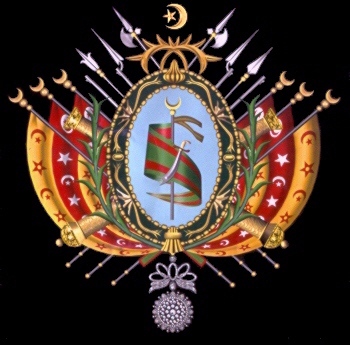 m. Major-General Prince (Sidi) Ismail Bey (b. 5th September 1934), elder son of H.R.H. Prince Muhi ud-din Bey, by his wife, Princess Wassila, daughter of Lieutenant-General H.H. Prince Ismail Bey, Bey al-Mahalla. She had issue, three sons - see above. (1) Prince (Sidi) Salah Bey. i) Princess (Lalla) Janaina [Djeneïna]. b. 21st May 1941. m. Si Ahmad al-Jaziri [Ahmed Dziri]. ii) Princess (Lalla) Rauza [Raoudha]. b. 15th June 1947. m. Si 'Abdu'l Sattar Meddeb [Abdelsattar Meddeb]. iii) Princess (Lalla) 'Aziza. b. 14th November 1958. m. Si Jalal ud-din Ghali [Jaleleddine Ghali]. ii) Lalla Aziza. m. 1942, as his first wife, Prince (Sidi) Muhammad Kamal ud-din Bey (b. 12th November 1924; m. second, ca. 1951, Lalla Jeanette, and d. at Err, Pyrénées, France, 23rd February 1980, bur. there), eighth son of H.H. Ahmad II Pasha, Bey and Possessor of the Kingdom of Tunis, by his third wife, Lalla Mah Razia. b) Princess (Lalla) Janaina [Djeneïna] (d/o the first wife). m. at Bardo, March 1898, Prince (Sidi) Muhammad ar-Rashid [Rachid] Bey (b. at the Dar al-Taj Palace, La Marsa, 1st October 1879; d. 3rd November 1928), second son of her uncle, Prince Mustafa [Moustapha] Bey, Bey al-Taula. She had issue - see above. c) Princess (Lalla) Wassila. b. 7th June 1911. m. H.R.H. Prince (Sidi) Muhi ud-din [Mohyedine] Bey (b. 22nd October 1911; d. at Marseilles, France, October 2006, bur. Sidi Abdelaziz Cemetary, La Marsa, Tunisia), third son of Lieutenant-General H.H. Prince 'Izz ud-din Bey, Bey al-Mahalla. She d. January 1993, having had issue, two sons and four daughters - see above. d) Princess (Lalla) Fatima. b. 18th February 1922. m. Si Nur ud-din Khayashi [Noureddine Khayachi] (b. 4th December 1917; d. 4th May 1987), a famous painter, son of Si Hadi Khayashi [Hédi Khayachi], a famous portrait painter, by his wife, Lalla Beya, née Ben Saïd. She d. 31st July 2001, having had issue, one son and two daughters. 4) H.H. Ahmad II Pasha, Bey and Possessor of the Kingdom of Tunis - see below. a) Prince (Sidi) Muhammad al-Adil [El Adel]. He d. young, 4th January 1904. (a) Prince (Sidi) ‘Abdu’l Aziz Bey [Abdelaziz Bey]. b. at La Marsa, 12th February 1988. (b) Prince (Sidi) Faisal Bey [Fayçal Bey]. b. 1st May 1996. (a) Princess (Lalla) Sonia [Sonia Bey]. b. at La Marsa, 2nd August 1982. (a) Princess (Lalla) Amina [Emna Bey]. b. 12th March 1984 (d/o Laura). (b) Princess (Lalla) Sirin [Cyrine Bey]. b. 24th January 1998 (d/o Nadal). (1) Princess (Lalla) Mamia. b. 12th June 1956. m. August 1976, Sidi Muhammad Djellouli, son of Sidi Mu'hsin Djellouli. She had issue, three sons. i) Princess (Lalla) Zanoukha [Zeneikha]. b. 20th April 1920. m. Si Ahmad Kashir [Ahmed Kchir]. She d. 18th December 1993, having had issue, one son and one daughter. a) Princess (Lalla) Amina [Manana] Beya. b. 1904. m. as his second wife, Colonel Si Muhammad as-Saghir [Mohamed Essghaïer], widower of Lalla Saliha bint Said Zaccaria, and younger son of Si Ahmad bin 'Abdu'llah Maria, an Italian convert to Islam, by his wife, Princess Traki, eldest daughter of Prince Husain Bey, Bey al-Taula. She d. January 1989. 1) Princess (Lalla) Hennani. m. Si Ahmad al-Qayiji [Ahmed Gaïgy]. She had issue, two sons and two daughters. 3) Princess (Lalla) Aziza. m. (first) Si Muhammad Zarruq [Mohamed Zarrouk] (d. 10th November 1899), only son of Lieutenant-General H.E. (Sahib al-Ma'ali) Sidi Ahmad Zarruq, sometime Minister for War and Marine, by his wife, Lalla Zanukha, daughter of Lieutenant-General H.H. 'Abu 'Abdu'llah Husain II Pasha, Bey of Tunis. m. (second) as his second wife, Sidi Salah Bey (b. 1843; d. at La Marsa, 1st September 1895), only son of Sidi Muhammad al-Amin Bey. She had issue, three sons and two daughters by her first husband, and one son by her second - see above. i) Si Iskandar Haidar [Skander Haydar]. m. Princess (Lalla) Beya (b. 1902), eldest daughter of Prince Muhammad ar-Rashid Bey, by his wife, Princess Janaina, second daughter of his uncle, Lieutenant-General H.H. Prince Ismail Bey, Bey al-Mahalla. He had issue, one son and three daughters. ii) Si Saifu'llah Haidar. m. Princess (Lalla) Hanifa Beya (b. 1904), second daughter of of Prince Muhammad as-Said Bey, by his wife, Lalla Zainab, daughter of H.E. Sidi Ahmad Haidar, Lord Privy Seal to 'Ali III. He had issue, two daughters. iii) Si Khair ud-din Haidar. m. Princess (Lalla) Janaina (b. 1899), eldest daughter of Prince Muhammad as-Said Bey, by his wife, Lalla Zainab, daughter of H.E. Sidi Ahmad Haidar, Lord Privy Seal to 'Ali III. He had issue, one daughter. iv) Si Nur ud-din Haidar [Noureddine Haydar]. m. Princess (Lalla) Fatima, fifth daughter of Lieutenant-General H.H. Prince Muhammad as-Sadiq Bey, Bey al-Mahalla, by his wife, Princess Aisha, youngest daughter of H.H. Muhammad al-Hadi Pasha, Possessor of the Kingdom of Tunis. He had issue, one daughter. i) Lalla Zanukha [Zeneïkha]. b. ca. 1897. m. Prince (Sidi) Muhi ud-din [Mouhi Eddine] Bey (b. at Manouba, 12th September 1897; d. at Tunis, 27th May 1967), eldest son of Prince Murad Bey, by his wife, Lalla Qamar, daughter of Sidi Ahmad Haidar, Lord Privy Seal to 'Ali III - see above. ii) Lalla Jamila. m. H.R.H. Prince (Sidi) Mustafa [Mustapha] Bey (b. at Manouba, 28th January 1900; d. 15th July 1974), sometime Head of the Royal House of Tunisia, second son of Prince Muhammad as-Said Bey, by his wife, Lalla Zainab, daughter of H.E. Sidi Ahmad Haidar, Lord Privy Seal to 'Ali III. She had issue, three sons and two daughters - see above. i) Lalla Zohra. m. Prince (Sidi) 'Ali Bey (b. at Manouba, 4th April 1903; d. at Salambo-Carthage, 25th September 1980), third son of Prince Muhammad as-Said Bey. She d. 5th January 1971, having had issue, four sons and five daughters - see above. a) Lalla Qamar [Kmar]. m. Prince (Sidi) Murad [Mourad] Bey (b. 14th December 1870; d. 1st March 1949), third son of Prince Husain Bey, Bey al-Taula. She had issue, two sons and two daughters - see above. b) Lalla Zainab. b. 1872. m. Prince (Sidi) Muhammad as-Said Bey (b. 24th November 1873; d. 26th May 1918), fourth son of Prince Husain Bey, Bey al-Taula. She d. 13th March 1952, having had issue, five sons and four daughters - see above. 5) Princess (Lalla) Hafsia. m. Si Muhammad al-Qayiji [Mohamed Gaïgy]. She had issue, two sons and two daughters. 6) Princess (Lalla) Mamia. m. Si Muhammad Kahiya, son of Si Bashir bin Sulaiman Kahiya. She d. 12th July 1935 (? ), having had issue, four sons and one daughter - see above.